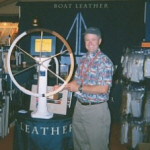 Leather products for the marine environment. We are a small company run by experienced boaters. We have been in business for over 20 years. We design our products to fit properly, function well and withstand the harsh marine environment. Our kits are intended for do-it-yourself people and utilize either hand stitching or Velcro fastening closures.